I wrote this as a companion piece to my other Titanic and Californian article (found here). It was whilst writing that, and attempting to put various sightings into some rough chronology that a few ideas occurred to me; I have managed to elaborate further with this speculative proposal about "The Californian Incident". I have tried, where possible to synthesize various ideas into a cogent, perhaps definitive discussion of this controversy. To be fair, it should be noted that some of the calculations in this piece are (at best) estimates, and may be slightly out; however, I do believe that the method that I have used is sound. If you spot any errors, or omissions, please email me at the address at the end of this article. How far apart were they? Please note that some textbooks use a value of 1.16 to correct for observation effects.. I have used this alternate coefficient in the calculations on this page; the alternate values are in square brackets. To see the maximum distance that two observers can see each other, just add their respective distances together. So for instance, two lookouts perched 100 feet above the waterline could see a ship's red sidelight 39 feet high, at a maximum distance of 11.4 + 7.1 = 18.5 miles [11.6 + 7.2 = 18.8 miles]. The use of this cumbersome equation is due to the curvature of the earth, and doesn't take into account visibility, light brightness, super-refraction etc, which could curtail or extend the range of eyesight. The key to perhaps understanding the geometry of the Californian-Titanic situation is to relate what each other saw. The Californian saw the Titanic's red sidelight; and the Titanic saw the Californian's sidelights. The Titanic's sidelights were 60 feet above the waterline, as seen by Groves, Gibson and Stone, who were 39 feet high (the height of the Californian's flying bridge) + 6 feet (an estimate of their height) above the water. This gives a total distance to the horizon of 16.5 miles [16.8 miles]. Similarly, for Boxhall et al. on the stricken liner, we get a value of 16.4 miles [16.7 miles]. It may be convenient at this stage to accept the smaller of these two values to enable the two ships to be seen. Note that, any further away and the sidelights would be below the horizon, and hence, invisible. This gives us the maximum distance, but what about the minimum distance? Let me backtrack slightly. In his excellent, if flawed book, Leslie Reade relates in "The Ship That Stood Still" how the relative movements of the two ships fit together perfectly. As the Californian slowly swung in the night, so her decklights would match what the Titanic saw perfectly. Although, probably not spotted at this stage, at 12.08, when Stone relived Groves on the Californian, the ship they saw was dead abeam. She would have been showing a green sidelight, her two mastlights (on the fore and main mast, the latter being slightly higher than the former, and about 70 feet apart), and perhaps a couple of other lights, not represented here. The Californian's masthead lights would be about 0.04 degrees (2.6 arc minutes) apart. 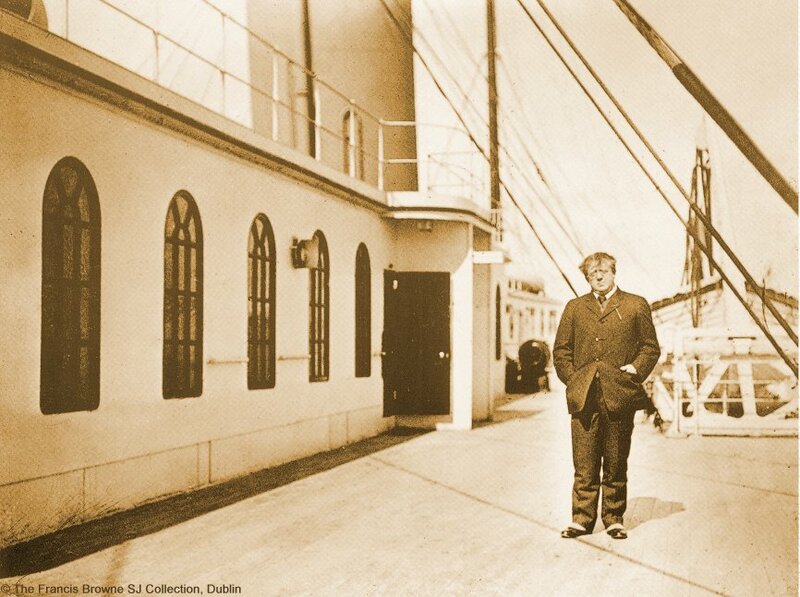 At 12.35, as he goes below to run his chores, Apprentice Gibson notes that the other ship (Titanic) is 1.5 points before the Californian's starboard beam. The Californian's mastlights would now be 2.5 arc minutes apart. This is approximately ten minutes before the first rocket was fired, and this therefore represents what Boxhall saw as he was waiting for Rowe and Bright to come to the bridge with detonators for the socket signals. The mast lights are displayed distinctly here as Boxhall would be observing them with binoculars, enabling him to make them out. As the 7th rocket was fired, Gibson observes the other ship 2 points on the starboard bow. 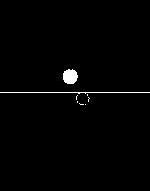 The mastlights would be separated by 1 arc minute, and would not normally be observable as separate lights. At some point in the evening, the Californian would be seen stem-on, showing all her lights. Finally, Boxhall is able to make out the other ship's red sidelight. Gibson observes the final rocket at 1.40am, 1 point on his starboard bow. 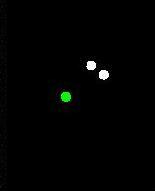 The angular separation between the two mastlights is only 0.5 arc minutes. However, Boxhall doesn't see the Californian's red light: to him, it looks like the other ship is only showing her stern light. Similarly, Gibson has also observed that the other ship's port light has now gone too. The Californian, pointing roughly southerly should be showing her port light at this point. The thurst of all this is as follows: I believe that, at this point, their respective red lights are below the horizon (shown as the solid white line).  The unfilled circle represents the position of the red light. Can we quantify the distance between the two ships by determining how far Titanic's bridge had dipped? It is possible to estimate it, but obviously there are no exact measurements. However, shortly after Boxhall left the Titanic, Mrs.Thayer noticed that A deck was only 20 feet from the sea. We also have the analysis of Harland and Wolff's marine engineers Bedford and Hackett who give us a value of 5o. I estimate (VERY roughly it should be stressed) that the bridge was only about 35 feet above the waterline at the time Boxhall saw the supposed "stern" light. How does this contribute to this analysis? Let us input the values. Firstly, let us assume that the redlights were just about invisible. Boxhall, whose line of sight was 35 + 6 feet above the sea could not see the Californian's red light (39 feet), which gives a distance of 14.4 miles [14.7 miles]. Let us do the same for Gibson: this provides a distance of 14.4 again. Any closer than this, and the red light would be seen. So, this means that the Titanic-Californian distance was between 16.4 [16.7] and 14.4 [14.7] miles. I would tend to place it closer to the shorter distance, as Groves watched the ship approaching from an even further distance away after 11.10. For this analysis, I will use the value of 15 miles as this is more convenient to work with. Sceptics of this work will (quite legitimately) say that no-one on either ship puts the distance so far; most witnesses say 5 or so miles. But let us not forget that these were estimates. Let us cite some examples showing how poor some people were at judging distances at night. Boat 5 was very close to the Titanic; but estimates of how far vary from 100 yards to a full mile. Boat 7 was close by; indeed the two boats tied together at some point during the night and their estimates vary from 300 yards to 1/2 mile. Evidently, one should not put too much weight on these estimates. It should be noted too that my computed Titanic-Californian distance may be influenced by the actual, rather than calculated values of the height above the waterline. These pictures of the Californian, taken the morning after the distance, show her to be riding slightly high out of the water. However, even an error of 4 feet in this determination only translate to an error of +/- 0.4 miles in determing the distance. What about the occupants of the lifeboats? Most people who saw the ship off the port bow only report seeing a white light - almost certainly the mastlights "fused" into one. This is logical as, from a lower vantage than the boat deck, they would be unable to see the Californian's red and green sidelights. Unfortunately I am unable to state absolutely just how high above the waterline the line of sight in a lifeboat would be. However, the photo below allows us to estimate this value. From the known length (30 feet) of a standard lifeboat, we can guess from this picture than an observer would be 5 1/2 feet above the waterline. Note that, in this picture, perhaps because of perspective, the crewmember at the tiller seems to nearly 9 feet tall! The crewman is standing up obviously, but let us tread carefully. To me, a value of 5 feet seems reasonable. To see the masthead lights of the Californian, approximately 100 feet above the waterline, the lifeboat would have to be no further than 13.9 [14.1] miles away. Again, close to the maximum 14.4 [14.7] miles distance calculated above. This makes me think that, from the waterline, the mastlights would be "right of the edge" of visibility. This may explain why, for instance, Boxhall lost sight of the lights as he rounded the Titanic's stern in boat 2, ending up only 200 feet from the starboard beam of the Titanic. At such a low height above the waterline, an error of +/- 1 foot equates to 0.3 miles. Only a few people reported seeing the sidelights from the water that night. To see them would require a distance of no more than 9.7 miles. Steward Crawford in boat 8 saw them at one point, as did the Countess of Rothes, seated a foot or two above him, managing the tiller. During the night, boat 8 pulled for the light(s) on the horizon for 3 hours, under the instructions of Captain Smith to land the passengers and return with help. Why would Captain Smith order rowers to deposit passengers on a ship that was too far away to be reached? Desperate men do desperate things. Boat 8 would have had to have rowed about 5 miles: is this possible in the three hours they were underway? The incumbants were pulling diligently, so it may be that they did get close enough to see the sidelights. However, to be fair it should be reported that the lifeboats were rowing into a southerly current which almost certainly would have retarded their progress in fetching help from the unco-operative Californian to the north.
. Unfortunately, a noted Titanic ignoramus has cast doubt of the whole matter of what lights were seen from the lifeboats, seeking to narrow the gap between the Titanic and the 'mystery ship.' Coloured lights seen from a low vantage point would indicate that the ships were relatively close. By selective use of testimony, it is argued that the true distance between the two ships was only 8 miles, and not a greater value. 13336. While you were in the [life]boat did you see any light or lights? I did. 13337. What light or lights did you see? I saw a red light first, and then the red light disappeared, and I saw a white one. 13338. What did you think the red light was? I could not say; I put it down to a steamer. The interesting thing about most of the offered testimony is that many of them do not give an indication of where they were, relative to the Titanic, when the coloured lights were seen. Had they been rowing towards the mystery ship, thus closing the distance between the ship and the lifeboat, allowing the coloured light to be seen? He saw: "Red light first, then red light disappeared, then saw white...Saw red and white at same time at same time at first ...Saw red and white, then red and white disappear, and then white remain...Both disappeared and left white...Both disappeared, then saw white light 10 or 15 minutes later in the same direction. His contradictory statements cast some doubt on what he did see and when. Did he see the red light first as he initially said, or red and white initially? 1566. Did you see any light? Well, I did see a light, a faint side light of another ship. 1569. Where was it?Off my port hand as I was in the (life)boat. Do you mean it was a port light? Was it a red or a green light? A red light - a side light. 1571. Now in what direction from you was it? That is what I wanted to ask - taking the bow of the "Titanic"? - Taking it from here it would be the starboard side. 1572. Broad on the starboard side? Yes, from her quarter. 1573. What, astern? - No, as she is left now it would be in that direction. 1574. Right out here? - Yes. 1575. Abaft the beam? - Just the same as she is lying now, on her quarter. 1576. That is where you saw the light? - Yes. 1805. (The Commissioner.) I am not quite clear about it. Did you see this masthead light and this sidelight before you got into the boat? No. 1806. Before you were on the surface of the water? No, I never saw it. 1807. And you saw one of them nine miles away when you were down in the boat? Yes. Lucas seems confused as to what he saw. He says he saw the lights on the starboard side of the Titanic, but we know that the strange ship was on the port side. Lucas is an able bodied seaman, but he talks about the light being on the "quarter" - this is to the rear of a ship. Finally, he says that he never saw the lights before he was on the surface of the water. Think about this. He could see further on the boat deck of the Titanic than on the surface of the water. He should have been able to see the red/green/white lights. And yet, from a lower vantage point, meaning a closer range, he sees lights from a greater distance. How can this be? It would akin to saying that, free of any visible obstructions, you can see New Jersey from the base of the Empire State Building, but not from the summit! 3502. Then you had not gone very far towards the light? A mile and a half. I am certain we pulled that. 3503. Did this light seem to get fainter or did it disappear suddenly? When we got away (in the lifeboat) it disappeared altogether. 3504. What coloured light was it? I think it was red. I think there were two lights, in fact, a red and a white light. 3505. (Lord Mersey) Are you sure? I can discern any sort of colour, racing, a mile and a quarter off, and I think I could see a red light. 3506. Are you sure? I am certain. It is difficult to know what Johnson means. He says that he pulled for the light when he was in the lifeboat. But then he says that the light "disappeared altogether" when he got away in the lifeboat. He could obviously see the light from the Titanic; it only disappeared after he left. Did Johnson mean that "he pulled away in the direction of the red light? 10801. Were you within sight when the ship went down? We watched all proceedings. 10802. Did you see a light while you were in the (life)boat? A supposed light do you mean? 10803 Yes, we thought there was a ships stern light. 10804. Was it a white light or a coloured light? It was a reddish light. 10809. And did you row towards that light? For a matter of about two hours as hard as we could row. 10807. On which side of the "Titanic" was it? Starboard. 10808. On the starboard side; and you thought it was the stern light of a ship going the same way as yourself in advance of you? - Yes. 10810. And did you lose sight of it in the end? - Yes. Was MacKay talking about the light on the Titanic's port bow that everyone else was talking about? If so, why did he say he saw the light on the starboard side of the ship. And is it not possible that the red light was in view because, as he said, he and his colleagues were rowing for two hours for the other vessel, thus approaching her? Did MacKay see anything at all? He refers to the light as "supposed." Even he was not sure what he was seeing! 17847. And before you left the ship's side did Captain Smith give you any directions with regard to a light? - Yes, he pointed to a light on the port side, the two masthead lights of a vessel, and told us to pull for there and land the people and return to the ship. 17848. Did you see those lights yourself? - I did. 17849. And what did you think they were? - I thought they were a vessel with two masthead lights. 17850. A steamer's masthead lights? - Yes. 17853. Having got down to the water's edge did you obey that direction as well as you could? - We did. 17854. And rowed in the direction of that light? - Yes, we pulled all night in the direction of the steamer. We have the same problem here as we did when we referred to Lucas's statements.  From a higher view, he sees two mastlights of a vessel but sees the coloured lights from lower down. Perhaps pulling for the lights "all night" allowed the side lights to come into visible range? One more valuable point needs to be made, and it is courtesy of Sam Halpern of the Encyclopedia Titanica message board: "William Lucas went away in Collapsible D. Didn't Collapsible D use the same davits as boat No. 2, the one that Boxhall got away in? That means that Lucas left after Boxhall. But wasn't it Boxhall who said the steamer shut in all her lights and showed what he took to be a stern light before he left the ship? So Lucas could not have seen a red sidelight, nor could James Johnson who was in Boxhall's boat if Boxhall was right about that." There are a few other matters of interest, and debate. The Californian's green light was observed by Boxhall and, if his testimony is anything to go by, only through binoculars.  Even Fred Fleet, whose eyesight had been tested for responsiveness to colours, only saw a white light. I posted an appeal on the newsgroups to clarify this matter (here) but it never really reached any consensus. On the subject of lights, Lowe saw the Californian's red and mastlights whilst he was preparing lifeboat 1 for lowering. Using the logic as defined above, he should not have been able to see the two white lamps separately, especially as he only give the ship "a glance". If I may be slightly flippant, it may be that Lowe had eyesight superior to his fellow officers...? To conclude this section, I propose the following situation, showing that, at 2.20am (in a location that we can be certain that the Titanic sank), the two ships were 15 miles apart. All artists depictions of the Titanic as seen at night show her to fully lit, every porthole blazing light. The collision is generally accepted to have occurred at 11:40pm, when most passengers would have been asleep. Furthermore the lights for companionways and public rooms would have been extinguished for the night. "a" denotes the 1st class smoking room, "b" denotes the 2nd class smoking room and the Cafe Parisian, "c" indicates the 1st class dining saloon and "d" is the 1st class lounge. Since they are so close to each other, "a" and "b" would be observed as a massive glow of light. There would also be navigation lights and a few other cabin lights. How big would such a broadside Titanic be? From 5 miles away, she would be seen to be 1.7 degrees across from bow to stern; at 10 miles, this would be 0.8 degrees; and at 15 miles, 0.6 degrees. A few other things should be raised. As referred to previously, the angular separation at night that enables us to see closely spaced lights is about 3 arc minutes. How does this translate into distance? At 5 miles, any lights within a distance of 13 feet would not be seperable. At 10 miles, the distance would be 27 feet. At 15 miles, the distance would be 40 feet. So, no rows of portholes (as Donkeyman Gill on the Californian said) would be seen. 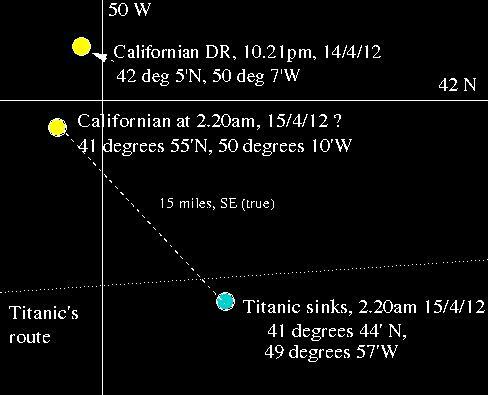 Another matter is just how much of the Titanic could be seen at these distances? At 5 miles, all of the ship could be seen; at 10 miles, everything 4 feet above the Titanic's waterline could be observed; at 15 miles, only those lights 42 feet and above could be seen - that is, the boat deck, and A and B deck lights, from the bridge of the Californian. The Titanic, hardly a massive blaze of light would be showing a glare of lights on her afterdeck (as Gibson said later) - which would be the smoking rooms. Other than a few stray passengers who had stayed awake to see the witching hour in (plus the navigation lights of course), there would be nothing else to see. Titanic researcher George Behe has also written on this subject on his website here. The only downside is, as George says, the model of the Titanic is too brightly lit. I believe the number of lights shown would be even fewer than the black and white retouched graphic as shown on his website. As above, but with the number of lights reduced, showing only patches of light. At this point in the analysis, I would have liked to refer to a fascinating website that partially explains the lack of light as seen by Stone and Gibson. Unfortunately, I cannot locate the website, so I shall briefly summarise it here. Consulting these two pictures of the Titanic's forward boat deck (the officer's quarters and the gymnasium), it should be noted that the deck lights have screens located which prevents any light from being seen, in relative terms, from the forward most portion of the deck. Therefore, another interesting piece of evidence that helps to remove the fantasy of a brightly lit Titanic, rushing to her doom. The numerals refer to the following events: (1) - Titanic sees the iceberg; (2) Titanic tries to dodge the iceberg by attempting a hard-a-starboard and then a hard-a-port manoeuvre and (3) the ship, facing in a northerly direction heads onward for a few more minutes at half speed. Let us examine what Groves on the Californian says about the Titanic when he first saw her. At the British Enquiry, he says that at 11.10, he sees a single white light, which he thought might have been a star rising (therefore, he sees it to the east). At 11.25, Groves sees another masthead light; since Titanic only carried one, he must have been mistaken in some way. By 11.30, Groves reports to the Captain that the "light" is a passenger steamer due to the large amount of light showing. At 11.40, the other ship stopped, or seemed to stop. Later Groves seemed to be mildly confused as to whether the lights he had seen were "put out" or "shut out" for the night - the latter being a common practise by passenger carrying companies as a prompt for the people to "go to bed". However, Groves agrees that the other ship might have turned 2 points to port, as the bright white deck lights were now obscured (or had gone out) enabling him to see the red port light. From reading the testimony, it seems clear that the court was using the Titanic's movement prior to the collision (a two point deviation to port) and the time of stopping to fix in their mind that the other ship was the Titanic. This is sensible, but, in my opinion, flawed. A two point turn to port at the time of the collision would not have shut out the Titanic's green light - which Groves never saw. The only way that the red light would be seen is if the Titanic was pointing somewhere between north-west and easterly...and the former option seems credible as he says that the ship was coming up obliquely to the Californian, and was not showing her broadside. Therefore, it makes me believe that when the Titanic was seen to stop by Groves at 11.40, the White Star liner had already manoeuvered in such a way to be pointing north... the collision must have occurred sometime sooner than this, and the "11:40" timing must be a coincidence due to the differences in ship's times. If the Californian had seen the Titanic before it started moving in an arc, then heading northward, then she would have been moving slightly south of west - in other words, getting further and further away, and hence making her lights even more indistinct, rather than brighter and clearer. If we take the computer simulation (from the Encyclopedia-Titanica website), then it would take about 6 minutes for the Titanic to come heading North. When Stone came on the bridge at 12.08 to relieve Groves, he saw the other ship and checked its bearing with the compass - which he saw to be SSE, directly on the starboard beam. The compass deviation that night was 2 points, so the bearing would be SE (true). I would direct the reader to the previous section of this piece discussing the amount of light visible to Groves, and later, Stone and Gibson. At 15 miles, only the lights of the boat deck (ie - very few), A deck and B deck would be observable. Regarding the Titanic's movements post-collision, an excellent discussion on a computer simulation can be found here. It is apparent that, when the Titanic performed her big arc, when she came to be heading North, her lattitude was roughly what it was before the collision. After this, she steamed on at half speed. Unfortunately, there is no consensus on how long this occurred. For the sake of discussion, let us assume 10 minutes. At half speed, this amounts to a distance of about 2 miles, which if steamed due north, puts the two ships distance at the time of the collision as being 17 miles. Again, these figures are rough, but illustrative. The main point is that, just after the collision, but before steaming on, more of the Titanic would be hull down (below the horizon), and hence less light would be displayed. An extra 2 miles south would obscure everything 67 feet above the waterline... which means only the mastlight would be seen. It may be that Groves saw nothing of the collision and its immediate aftermath. It now seems likely that Mrs.Roberts' maid was on E-deck. A further hypothesised occupant on these B-deck cabins (the famous Margaret "Molly" Brown) could have been located on E-deck too. Of these two cabins, B3 and B5, information is sketchy, but thanks to the generous help of George Behe, the following may be said: Mrs.Roberts may have been trying to get some sleep - in various accounts, she had either "just dropped off to sleep", "was awakened by the crash" or "was awake in her cabin when the crash came". It may be that she was dozing in her cabin with the lights off. Miss Allen had either just retired to her cabin (where Ms.Madill had already gone) or was in the library. It seems possible that, at the time of the collision, this cabin's lights were on. Even so, it provides more credible evidence that the Titanic must have been showing very little light forward of her bows. With regards to other areas of the forward superstructure, I suspect that the bridge would be in a darkened state too. In short, Titanic would appear to be poorly lit, with most, if not all the lights, coming from the right of the port lamp - as Gibson said later. Thanks to data recently discovered for the Olympic in 1929, we know how much light the various areas on the Titanic would show...and it is surprisingly little. Most of the first class areas would have a value of no more than 2 foot-candles, or the equivalent of 2 candles as seen from 1 foot away. How far can a candle by seen at night by the naked eye? We are told that it would be 3 1/2 miles or less if one takes into account atmospheric absorption; another website suggests a value of 1 mile. Taking the average of these (2 1/4 miles), and bearing in mind the inverse square law, how many foot candles at 12 miles would be needed to see the Titanic? We get 38 foot candles. With lights contributing from the smoking rooms, companion ways, cabins and state rooms, smoking rooms, reception rooms, and perhaps dining rooms, we can easily exceed this number. The greatest contribution to this would be the 1st and 2nd class smoking rooms (a total of 4 foot candles) and the 1st class reception room (2.2). Due to foreshortening of the Titanic as seen from an oblique angle, these comparatively highly illuminated areas would be seen close to the stern...as Gibson had said under interrogation. This leads us to the heading of the Titanic, as she ultimately "finished with engines". Today, the bow section of the wreck lies facing "slightly east of North", as Dr.Ballard said shortly after her discovery. A Royal Navy salvage engineer I spoke to said that this would be the heading of the ship before she went down. This leads to a conundrum! George Behe places the Titanic heading slightly north of NNW -in line with Gibson's statement at the British Enquiry. This is quite true, and survivors accounts place the "white light" anywhere between 1/2 point and 4 points off the starboard bow. Of course, it may be advisable to use Boxhall's testimony, since he was observing the other ship for the longest period of time. He says that, at first the other ship was 1/2 point away, and when he last saw her, she was 2 points away. Of course, both ships were stopped, but the Titanic may have been turning in the drift, giving the impression to Boxhall that the ship he was seeing was steaming off. QM Rowe on the Titanic says that the stern was swinging making the bow face North. However, Pitman, lying close to the ship off the starboard side didn't see the Titanic turning. It should be noted that Pitman was evidently not the most observant of witnesses as he failed to see the ship breaking up as she sank! One final point: Lawrence Beesley, for one, reported that his boat (13) rowed forwards in the direction that the Titanic was heading before she sank - and this turned out to be North-West. Of course, it may be that the Titanic was heading north, or NNE when she sank... this would also have opened up more lights to the observers on the Californian, but not by much. 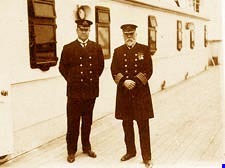 Steward Crawford's evidence also seems to indicate a NW heading of the Titanic. After news of the disaster has broken, and according to Groves, he sees the Carpathia at about 6.50am, abeam on the port side. The Californian cleared the icepack at 6.30am, so, in those twenty minutes, assuming a directly southerly trajectory (and not allowing for the influence of drift which might have helped), she must have made 4.3 miles at 13 knots. It is generally accepted that the drift that night was 1 knot to the south; as the wind came up and the water became choppy towards daybreak, this may have increased. However, it is difficult to quantify this, so let us assume a 1 knot drift that night and day. At 6.50am, the Carpathia would have been at the wreck site, offset by 4.5 hours of drift, placing her at approximately 41o40' North. This places the Californian at 41o44'N as she cleared the icepack at 6.30am. Captain Moore of the Mount Temple saw the Californian crossing from east to west at 6.00am. He places the Californian as being 5-6 miles north of him, and the Carpathia 5-6 miles east, corroborating the Californian's lattitude at 6.00am. Working backwards, we have, at 2.20am, the Californian would have been a further 4.5' North...or roughly at a lattitude of 41o49' North. At 11.40, she would have been nearly 3 miles further North again (41o51' North). When she stopped, at 10.21, she would have been at 41o53' North. This doesn't tally with the estimate I made for the position at the start of this article, as it places a great deal of emphasis on exactly where the Carpathia was relative to the actual sinking location. These values are also suspicious because they would enable the sidelights of both ships to be seen for a greater time than actually occurred. Once pulling away from the Titanic's side, Boxhall in boat 4 wound up on the starboard side, and, lay there watching the ship sink. Boxhall's boat was the first to be picked up shortly after 4.00am, after heading towards her green flares. The occupants in boat 4 reported that they only had one seaman in the boat, which, together with Boxhall's story, makes me think that the boat simply drifted for two hours south -in the current. Certainly, she made no attempt to rescue the dying swimmers. So, Boxhall and his crew must have been to the south. 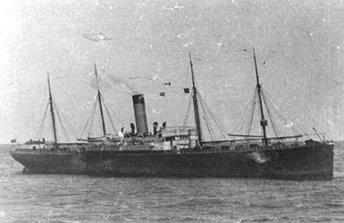 It was about half an hour before the Carpathia picked up any other lifeboats (boat 4 had been picked up as dawn was breaking). 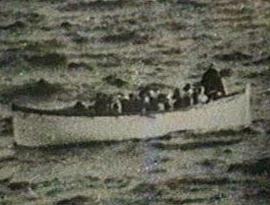 Ismay escaped in collapsible boat C, which had headed for the mysterious light on the horizon, and was 3/4s of a mile, stem-on, when the Titanic went down, somewhere between 35 and 15 minutes after the boat left the ships' side. Boat C pulled for the light, as Rowe said, "We pulled through the night, but seemed to get no nearer to the lights. So we altered our course back to a boat that was carrying a green light. During that time daylight broke and the Carpathia was in sight.". It would seem natural to assume that, with an initial heading of north, or north-west, and then turning round and heading for Boat 4, and then the Carpathia (and allowing for the southerly current), boat C was either north or perhaps approximately at Titanic's lattitude. Why do I mention this? Simply because when Ismay boarded the Carpathia, he noticed a clock and it said either quarter to, or quarter past 6. So, we know extremely roughly where the Carpathia was at about 6.00am - at the time the Mount Temple saw her and the Californian. Conversely, if we take the 15 mile distance, at a bearing of SE/NW to be accurate at all times that night, we can come up with some more co-ordinates, if we say that the Californian was at 41o55'N at 2.20am. We know the Titanic was at a lattitude of 41o47'N when she struck, if she was on track. She steamed Northwards for some time, to end up at some location. However, let us say that this was negligible, as it is difficult to factor in. When the Titanic struck, the Californian would have been at 42o58'N. When Californian stopped at 10.21, this would put her at about 42oN. At 6.00am, she would be at 41o51'N... 7 miles north of the wrecksite. Captain Lord estimated that he was at 42o5'N, 50o7'W when he stopped for the night. I would put him at 42oN, 50o10'W, a difference of 6.3 miles. All these numbers assume a southerly current with no east/west component. However, Stewarts Pole Star sighting at 7.30pm (giving a lattitude of 42o5.5' N) excepted, the agreement between these numbers is satisfactory. One other thing should be said about the navigation of the Californian. The next day, before resuming her voyage to Boston, Captain Lord and his officers calculated that they had left the Titanic's flotsam at 41o33'N. This has been criticised by researchers and described as an attempt to push the Titanic's overnight position even further south to absolve Lord et al. of blame. However, there is confirmation of this lattitude. At 12.10am, the SS Frankfurt, heading South, saw the Californian emerge from the ice floes directly ahead. The Frankfurt was at 41o35'N at the time. For too long now, the positioning of the Californian with respect to the Titanic has been like a game of "pin-the-tail-on -the-donkey". Find the Titanic. Draw a line in whatever direction you want and theres the Californian. Very little attempt has been made to explain the locations, based on what was seen. The "5 mile", or "10 mile" mantra has been repeated with very little thought by the opponents of Captain Lord. On the other hand, the arguments of Senan Molony, Leslie Harrison et al., although weak, do provide one strong point of discussion. For the Californian to have wound up so far south, would mean a massive error on the part of the stellar observations, steering and/or drift that night. This, to my mind is impossible. I suspected that the Californian stopped roughly where she said she was, so I was surprised, and delighted to have this confirmed during this analysis. Were it not for various conflicting pieces of testimony, the "mystery" should not have endured for as long as it has. With the bulk of the evidence supporting the hypothesis that the two ships were in sight of each other, there are bound to be pieces of the story that don't fit in (such as Groves first seeing the ship well aft of the starboard beam, seemingly putting its motion eastward, and Stone seeing a moving ship whose rockets only went up to half the height of the mastlight). In actual fact, the socket signals from the Titanic went up to 600-800 feet according to available literature from the period. If we take the lower of these two values, then it means that an observer at sea level 28.4 miles from the point of detonation (along the surface of the sea) could see the rockets, depending on the brightness of the explosion. For Captain Lord's supporters to insist that none of the Titanic's rockets were seen means that she must have been this distance away from the Titanic - in fact, if we take the height of Stone and Gibson above the water line, then the distance becomes over 36 miles! Compare this with the distance from the wreck site to Captain Lord's claimed location - approximately 21 miles. It is impossible to imagine anything that would cause such a huge error in navigation to prevent the Californian being outside the range of the rockets. An animation is shown below. The graphic above denotes (left) a lit Titanic as she would be seen from 12-14 miles away; the ship is partially hull down so that the horizon obscures many of the lower decks. The explosion above the Titanic is how far a rocket would be seen to ascend as it attained the minimum height of 600 feet above the deck. The horizontal grey line denotes the horizon. The centre digram shows how far the rockets would ascend, compared to the first graphic, when fired from a distance of 21 miles, the claimed Titanic to Californian distance. The small ship denotes how the Californian (as an example of a "ship like us" that Capain Lord claimed to see when he was stopped in ice) would looks when viewed from 5 miles away. This 'Californian' is oriented the same as the lit graphic of the Titanic, with her port light showing. Note two things: the first is that the 'Californian' is roughly the same size as the lit Titanic. Without being able to see all the deck features of the lit Titanic, it would be impossible to make a determination of actual size. The second point is that, even at 21 miles, the rockets would rise well above the 'Californians' decks; how then could 2nd Officer Stone see rockets fired from a great distance but only go up to "half the height of the mastlight of the other ship"? How could Stone see low-lying rockets but not ones fired from 21 miles away? The final graphic shows the model of the Titanic that was used to create the 'lit' Titanic image, allowing a comparison of size of the three images. We should bear in mind two important conclusions: the image is an exagerration of the altitude that rockets would reach. For instance, the rockets sent aloft from the 'lit' Titanic would reach an altitude of very nearly half a degree. This is the same width as a full moon and it would be an instructive and valuable exercise for the reader to see from him/herself just how big this would be when the moon's lower limb is touching the horizon. Another way to view this problem is to observe the rocket explosion graphics from a suitable distance in order to accurately compare the images above with what would have been seen from the Californian. On my computer, the graphic is some 8.5 centimetres in height; to see the images as they would have been seen, one would need to be 33.8 feet (!) away from the computer screen. How high would rockets have to ascend for them to be seen to ascend to no more than half a mastlight, relative to a ship 5 miles away? Trigonometry can assist us, and yields a result of some 90 feet. This is relative to the surface of the sea; relative to the height above the back deck, we find that the rockets would have to reach a height of about 30 feet. This is obviously nonsense, and would pose great risk to the people on the boat deck of the Titanic. The rockets cleared the masts and funnels at least. In fact, this whole point of the brightness of the detonating rockets being more of a deciding factor in their visibility can be qualified by some basic conjectures. Readers are invited to read Dave Gittins website; as a navigator, he approaches various practical Titanic problems from a novel point of view. Consider the Carpathia. Traditional Titanic-lore suggests that she was racing at 17.5 knots during her dash to the north. This is a physical impossibility. Her true speed may have been 14-15 knots. She was about ten miles away from the wreck site when her officers saw Boxhall's green flares, sighted at approx. 3.15am. This was about 1.5 hours after the last rocket was fired. This gives a rough distance from the wreck site of 1.5*(15) + 10 = 32.5 miles at 1.45am. Rockets fired, and reaching a height of 600 feet could be visible for up to 36 miles. Every officer on the bridge of the Carpathia was scanning their direction of travel, looking for icebergs - and they saw no rocket detonations. Conversely, the Californian's Stone and Gibson saw the Carpathia's rockets fired at about 3.15am. If the above essay is correct, then the distance between the Carpathia and the Californian must have been 15 + 10 miles = 25. These rockets were seen, but at the limit of visibility. So, from this, the observable range of the rockets was between 25 and 32.5 miles. Readers may wish to read about the inverse square law to explain how the intensity of light diminishes with distance. A reader has asked, in a confrontational tone, why the Carpathia's company signals were not seen. This is actually a good question, but there is no evidence that they were fired; the only person who mentioned this is Captain Rostron, and absolutely no-one else. With regard to pyrotechnics fired from the rescue ship, Rostron is unclear about whether the rockets from his ship were fired every fifteen minutes, or is response to the green flare from boat 2. This is not a criticism of Rostron; he had a lot to think about that night but it shows that even his testimony, given in good faith, could have an error or two it. Besides, from a person low down in the water on a lifeboat, a flash of light on the horizon could be a rocket or a roman candle; they would have no way to know which is which. Putting these little niggles aside, the only mystery is one of psychology: the relationship between Lord and Stone, and why information just wasn't getting through from the bridge. Why wasn't enough urgency placed on the sighting of rockets? In an interview with Walter Lord, when writing "A Night to Remember", Groves recalled Stone as being lazy, and taken to snoozing in his cabins between watches - a man who wasted life, as Groves said. He also said that Stone was afraid of Captain Lord. In such circumstances, Stone may have been the sort of person who didn't want to press the issue, as Groves said to Walter Lord. As Stone said, he simply informed the master (Capt.Lord) of the situation and left him to judge. Lord relied on Stone, the Officer of the Watch. And so, the information just didn't get through. And if Ivan Thompson was correct in his letter to W.Lord, this caused frustration to the men on the bridge: they tried and tried to get the Captain out of the chart room where he was sleeping, as Thompson said. You will note that I have been very sparing in using Stone's testimony or affidavit as it simply doesn't relate to what happened. Similarly, Gill, who I have never trusted, is not regarded here as his story is very flimsy. Regarding the navigational aspects of the case, the two ships were certainly more than 10 miles apart. 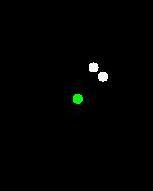 Had they been any closer, then Boxhall's green flares would have been seen by the Californian crew. Therefore, if I am right, this would make Lord Mersey's 5-10 mile distance estimate very wrong indeed. At 5 miles, the Titanic would be an unmistakeable sight. The only untested part of this theory is whether the ships could see each over such a distance: I have no data on the power output of either ship's navigational lamps. However, an attempt was made to replicate the Titanic- Californian situation in 1996, during the RMS Titanic Inc memorial cruise. Two ships, of intermediate size between that of the Titanic and the Californian were placed 16-19 miles apart and rockets were fired, which reached a height of 750 feet. The rockets were seen, as expected, but so were the mastlights of the other ship, albeit very faint. The cruise liner Royal Majesty observed the proceedings while the research vessel Ocean Voyager fired the rockets. I was intrigued to know how the Ocean Voyager compared to the Titanic. Sadly, details for this ship, which sank in 2002, are scarce, as are pictures. In the end, I had to compare an image of this ship and French vessel "Nadir" (2hose dimensions are known) from page 8 of "Titanic International"'s Voyage magazine, issue 25. I estimate that the Ocean Voyager is about 240 feet long and the height from waterline to the top of the mast is about 76 feet. Of course, the mast light would be afixed some distance below this. I estimate that the height from water line to the bridge would be approximately 38 feet. Remember that only the mastlight was seen, faintly. I estimate that the top deck of the Royal Majesty (the ship "doing" the observing) was about 85 feet above the water, Applying the forumula above, we get that the maximum observing distance from the top deck of the Royal Majesty and the top of the Ocean Voyager's mast would be 20.5 [20.8] miles. So, it would seem that, the lights are visible for quite a fraction of the distance to the observable horizon. And of course, observaing conditions on the 14th and 15th April 1912 were extremely clear. Since the above was written, new information has come to light. Sam Halpern's analysis of the Titanic's mastlight on the Titanic Research and Modelling website shows that, at 17 miles, the light would be as bright as a star with an apparent magnitude of 1: see here. To give an indication as to how bright this is, the two lower left stars in Orion's belt, Alnitak and Alnilam, are magnitude 1.7. Magnitude 1 is twice as bright and would be very noticeable, especially if you bear in mind that the only other star of comparable brightness as seen from the Californian in the south-east would be Antares - also magnitude 1. Titanic's lights would therefore be noticeable and obvious. In fact, Antares would be on the horizon and rising at about the same time that Groves saw the other ship's light at 11.10pm; Antares is in the same direction as this light and would naturally have drawn ones eyes to the ESE. There may come an occasion when I revisit the data in this page; Wikipedia's entry on the observing capability of the human eye at night indicates a 1' angular resolution, much less than the 3 arc-seconds quoted above; time permitting, I need to collate my thoughts and revise this article. To summarise, the physics and geometry of the Titanic-Californian is, for the most part, quite simple, and the two ships could be seen. But the bigger mystery is that of the inaction of the Californian. What we can't do is psychoanalyse the men on the Californian, their relationships with each other, and their abilityt to take the initiative in unusual situations. If we could, we would finally know just why the whole mess was allowed to happen.